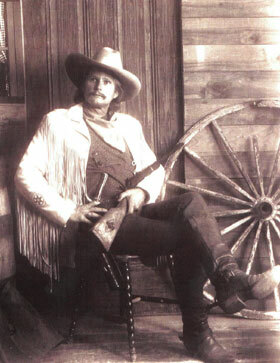 Jim Stuckenberg is one of the most widely recognized and sought after Western artists since Frederic Remington, and C.M Russell; yet, this fact alone does not make him a mystery. 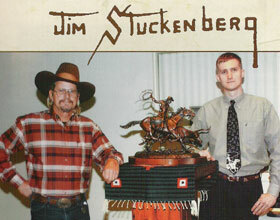 It is the amazing fact that Jim Stuckenberg is one of the last true “Cowboy” Artists. 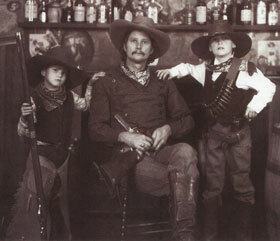 Even as Jim’s work became more and more sought after, he never neglected to spend time around the things that gave him the greatest inspiration his sons, Will, David, and Daniel; and his horses. Many art critics realizing the rarity in Jim’s work suggested he set aside his love for horses and focus exclusively on his art career. However, Jim soon proved his merit in the horse world too as the owner and trainer of many champion horses. 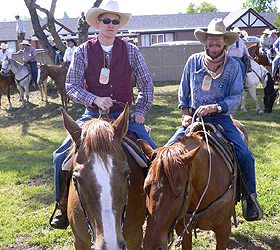 Jim’s horses have set multiple racetrack records, become AQHA Champions, NCHA futurity winners, and one horse, “Peanuts,” was even inducted into the Rodeo Hall of Fame. Today, the quality found in a Stuckenberg is unheard of and it shows. 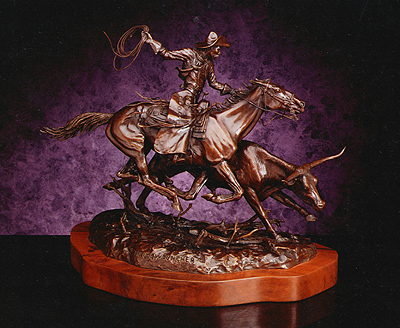 Jim has won or displayed at some of the most prestigious Western Art shows and museums in the country including the George Phippen Memorial, Gilcrease Museum, Woolaroc Museum, and many others. Since the mid-eighties, the phrase “quality investment” has become a familiar phrase when discussing Stuckenberg’s Art. As companies and private collectors receive word of Jim’s work, his pieces continue to grow in fashion and rarity with most clients ordering pieces before they are even created. Jim’s art has long been coveted by various Fortune 500 Companies like Wells Fargo and Leggett & Platt, who enjoy it not only for its one of a kind quality, but for its investment appeal as well. Jim’s works have also adorned the homes and ranches of many notable families like the Hurst’s, Cleberg’s, Russell’s, and Rogers’; and the homes of Hollywood stars like Ben Johnson, Fess Parker, Duncan Renaldo and many others. Emphasizing accuracy, Jim’s works are known for their true realism and factual content. He does do his homework; one of Jim’s recent trips took him through the Southwest to study an Indian tribe he was painting, and then to some favorite spots in Texas and Arizona to take pictures of mesas for use in the background of a painting. Jim loves what he does so much it is not uncommon for him to personally drive across the United States with a piece of art just to see the delight on someone’s face when it is finally delivered. Sculpture, Oil, Watercolor, Pen & Ink, and Pencil. The Quarter Horse Journal, Western Horseman, Southwestern Horseman, Santa Barbara Magazine, The Pacific Coast Quarter Horse, America’s Horse, Eastern / Western Quarter Horse Journal, Continental Horseman, Speed Horse, and Cowboys & Indians. 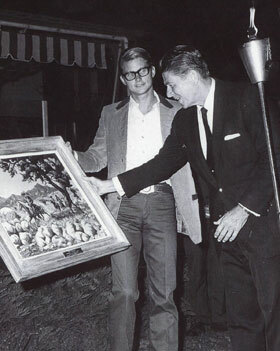 Ronald Reagan as Governor shown receiving a painting from Jim at Hope Ranch, September 29, 1969. Jim and son David at the Rancheros. 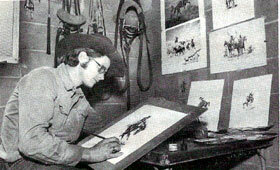 Jim drawing a traditional style pen & ink while at the Los Alamitos track.1972. Jim and sons Will & David.1986. 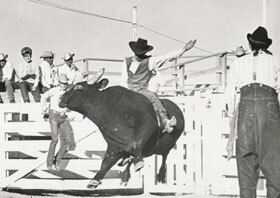 Jim riding the famous saddle bronc Whiz-Bang. 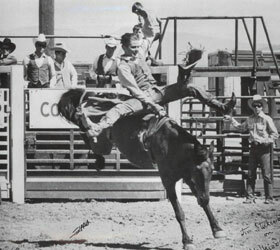 Reno 1968. Jim riding Red Eye. Tucson 1967. 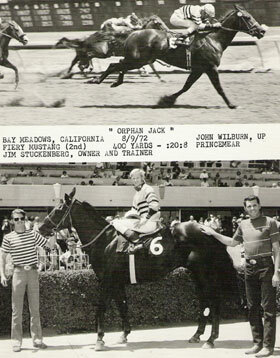 The win picture above is one of the first horses Jim both owned and trained. Jim has won over 90 races to date.